Home / MOVIE TRAILERS AND INFO / ‘Born to Dance’ biggest hip-hop dance movie storms in Philippine cinemas! ‘Born to Dance’ biggest hip-hop dance movie storms in Philippine cinemas! An ambitious young man from Auckland dreams of being a professional hip-hop dancer. 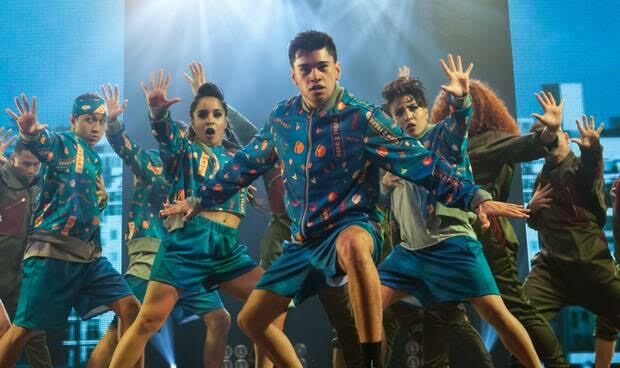 Born to Dance is a movie about Auckland teenagers with dreams of hip-hop dance stardom, and its shot through with dance sequences that tell the story of their desires in vivid, explosive fashion. Director Tammy Davis, making his feature debut, says he was drawn to the script of Born to Dance because of the way it showed "young Maori and Pacific Island kids aspiring to be the best they can be". Yet he freely admits that he didn't know how much dance talent was in his home town, ready to take on the world. Much of this energy comes from a dynamic young dancer-choreographer, Parris Goebel, whose credits include choreography for Janet Jackson, Cirque du Soleil and Nicki Minaj, and the development of her own ferocious dance style that she calls Polyswagg. Her talents are most recently shown in a wonderful video that she created and danced in, alongside female members of her Royal Family crew, for Justin Bieber's Sorry. It has had more than 63 million YouTube views. "When I first met Parris and the kids," Davis says, "they were just amazing, and they blew me off my feet. I had no idea they even existed." Goebel choreographed the film, and also makes an appearance leading a terrific face-off dance sequence in a club. Born to Dance stars Tia Maipi as Tu, dreaming of a career as a dancer, who hopes that his crew, 2PK, can make its way to the national championships. He's also drawn to the possibilities offered by K-Crew, world champion dancers who are auditioning for new members. His loyalties are torn. He continues to practice with his friends, yet in secret he's taking part in the long-drawn-out auditions, and he's attracted to Sasha (Kherington Payne) a K-Crew member who's the girlfriend of its overbearing leader, Kane (Jordan Vaha'akolo). With all this and more, going on, something's got to give. The casting process for Born to Dance involved not only finding the best dancers, Davis says, but also finding people who were a good fit, dramatically, for a range of roles. To play Tu, Davis says, "We needed someone who had self-belief". Yet he didn't want this to be too prominent. "Tia was only 17 turning 18 when he shot the film, he was very shy. And I liked that about him, it was like he hadn't fully realized his potential, which was so similar to the plotline of the film. So I tried to harness that, and not push him too far from what he really is." Working on a movie, Davis says, "I always find my relationship to the script, because that's really important. For me, it was Tu, I've been that kid before, I was Tu and I still am, making this film was a dream of mine." When Davis was Tu's age, he says, he hadn't found out what he wanted to do. "I had left school and was working on a farm, driving tractors. Then I went up the mountain putting chains on cars and now boarding every day." He'd had contact with the film world, however, through a family connection, his half-brother, Julian Arahanga, who played Nig in Once Were Warriors, and Apoc in The Matrix. He went to drama school at 19, but still hadn't really thought about acting. "My brother had friends who were gaffers and grips and I thought I'd go that way, but then I started performing on stage and I thought, oh, this is cool too." Davis' film roles include Whale Rider and Black Sheep, and he's been in a host of New Zealand TV series, most notably in the long-running Outrageous Fortune. Right now, he's focusing on working behind the camera. "I've written five one-hour dramas I'm pitching at the moment that I want to make, and then I've got another feature, based on Ebony Society, a short film I made." Ebony Society, which was selected for Sundance and Berlin, is a disarming tale of two boys who find more than they bargained for when they take part in a house break-in over Christmas. There's talk of a second Born to Dance film, he says, but his own projects are his priority right now. “Born to Dance” is released and distributed by CAPTIVE CINEMA.